Twenty-four of the Buddha's most distinguished disciples are brought to life in ten chapters of rich narration. Drawn from a wide range of authentic Pali sources, the material in these stories has never before been assembled in a single volume. Through these engaging tales, we meet all manner of human beings rich, poor, male, female, young, old whose unique stories are told with an eye to the details of ordinary human concerns. If read with careful attention, these stories can sharpen our understanding of the Buddhist path by allowing us to contemplate the living portraits of the people who fulfilled the early Buddhist ideals of human perfection. While in recent years in the West oceans of ink have been expended on books dealing with the Buddha and his Teaching, the first two of the Jewels of Buddhism, the coverage given to the third Jewel, the Sangha, has been far from adequate. This book is an attempt to fill this gap in Western Buddhist literature with living portraits of twenty-four of the most distinguished disciples of the Buddha. The book evolved from a series of individual tracts which are known as the Lives of the Disciples series from the Buddhist Publication Society's well known "Wheel" imprint. The first of these small biographies to appear, in 1966, was written by Ven. Nyanaponika Thera, the founder of the BPS. In the same year, by coincidence, the German Buddhist author Hellmuth Hecker began publishing short biographical portraits of the great disciples in the German Buddhist periodical Wissen und Wandel. Over the next twenty years, forty-one such short profiles appeared in German. Ven. Nyanaponika translated or oversaw the translation of this series into English and published the series of BPS Wheels in the 1970s and 1980s. 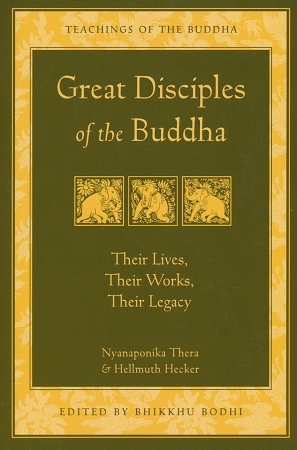 Ven Bhikkhu Bodhi has compiled, edited, and enlarged the original series to the form in which they now exist, as this inspiring and comprehensive survey of the great disciples of the Buddha. I loved getting to know the people at the time of the Buddha. From wondrous and supramundane to daily life- I had the feeling that I was there, listening to the Buddha speak to the disciples around me. This book adds much needed context to many great suttas, using them in part to tell the story of the characters. Very inspiring. So well written, feels like I have meet them. I bought this copy for a friend. Inspired me to read my copy for a fourth time. Very highly recommended. It's a jewel! Such a strong source if inspiration..., easy to read & full of teachings conveyed in a simple way. The struggles, challenges & triumphs of these Disciples remind us of the how sustained effort & faith in one's personal quest is always the light with which we will be able to achieve our aims. If you are looking for a book that is easy to read and inspirational this is just the ticket. It is told in story form so it is engaging. It does not dwell in high philosophy. Rather it just tells stories about the disciples who were in contact with the Buddha.